A patient with advanced-stage heart failure recently received the HeartAssist 5® Ventricular Assist Device (VAD), in a first-of-its-kind, life-saving procedure carried out at the Deutsches Herzzentrum Berlin (DHZB – German Heart Institute) in Germany. The device was developed by ReliantHeart, a Houston-based innovator in mechanical circulatory support therapies. The company earned CE Mark approval for design enhancements of the device in Europe only a few weeks ago. The HeartAssist 5®, a next-generation ventricular assist device that is currently the world’s only fully remotely monitored VAD, is an implantable electric pump designed for use in patients requiring ventricular support due to end-stage heart failure, and offers natural human pulse circulation support to a weakened heart. 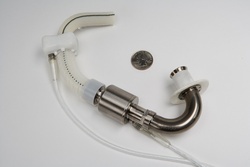 The device weighs a mere 3.3 ounces and it is implanted above the diaphragm. At the core of HeartAssist 5® is the 24/7 HeartAssistRemote™ Monitoring System, which uses vadlink.com to continuously receive and transmit patient data to expert clinicians. These optimized device features, combined with a proprietary true-flow measurement system, allow a faster and more precise diagnosis of potential clinical issues. Although commercially available in Europe, the HeartAssist 5® is considered an Investigational Device in the USA by the Food and Drug Administration (FDA), and US clinical trial is expected to begin in late 2014. ReliantHeart, Inc. is a Houston-based leading innovator in mechanical circulatory support therapies for patients with advanced-stage heart failure. Having earned CE Mark approval for this device is an important milestone for the company, as they try to achieve FDA clearance to enter the US market.